New! MM Technical Services: MM’s Engineering Team will provide setup recommendations specifically tailored for your Mustang. Get help choosing options for a Maximum Grip Box, deciding on coil-over spring rates, selecting a brake master cylinder, and advice on converting your Fox to Hydroboost. New! Swapping a Coyote into a Fox Mustang? MM's Hydroboost Conversion Kits allow easy installation of a 1996-2004 Mustang Hydroboost power brake assist unit into a 1979-1993 Mustang. New! Swapping an IRS into your Fox Mustang? MM makes it easier with a brake line kit made just for this conversion. Bolts-in, with no cutting or flaring of brake lines. Designed to fit standard IRS brake hoses. New! MM now offers a tool for the giant nut securing a Mustang Hydroboost. This MM socket fits the 1-7/8" nut holding the Hydroboost to the firewall mount. Required when changing a Hydroboost unit. New! MM's billet aluminum Pedal Box Spacer for Fox Mustangs. 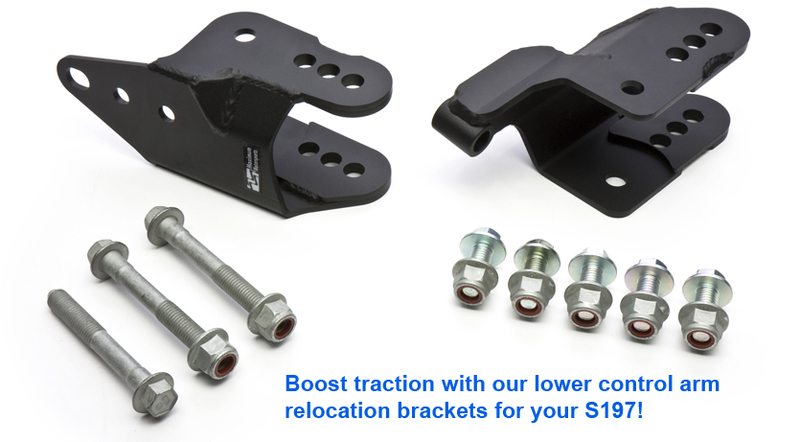 Replace the breakage-prone OEM plastic spacer when converting to manual brakes or Hydroboost. Canadians! Please read the latest about ordering from Canada/shipping to Canada.